Known as Oklahoma's favorite son, Rogers was born to a well off Indian Territory family and learned to ride horses and use a lariat so well that he was listed in the Guinness Book of World Records for throwing three ropes at once—one around the neck of a horse, another around the horse's rider, and a third around all four legs of the horse. 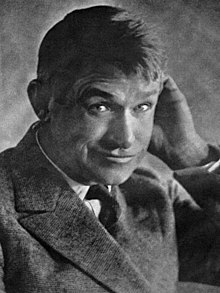 During his life he traveled around the world three times, made 71 movies (50 silent films and 21 "talkies"), wrote more than 4,000 nationally-syndicated newspaper columns, making him a world-famous figure. By the mid-1930s, Rogers was loved by the American people, and was the highest-paid movie star in Hollywood at the time. During an around-the-world trip with piolt Wiley Post, Rogers died when their small airplane crashed near Barrow, Alaska Territory in 1935. ↑ Rogers State University (2007-04-18). "RSU and Will Rogers Museum to Discuss Possible Merger". Press release. http://www.rsu.edu/news/2007/04-18_willrogersmuseum.html. Retrieved 2007-07-20. This page was last changed on 2 September 2013, at 19:04.